↑ Zeitler, Peter K.; Koons, Peter O.; Bishop, Michael P.; Chamberlain, C. Page; Craw, David; Edwards, Michael A.; Hamidullah, Syed; Jam, Qasim M.; Kahn, M. Asif; Khattak, M. Umar Khan; Kidd, William S. F.; Mackie, Randall L.; Meltzer, Anne S.; Park, Stephen K.; Pecher, Arnaud; Poage, Michael A.; Sarker, Golam; Schneider, David A.; Seeber, Leonardo; and Shroder, John F. (October 2001). "Crustal reworking at Nanga Parbat, Pakistan: Metamorphic consequences of thermal-mechanical coupling facilitated by erosion". Tectonics খণ্ড 20 (5): 712–728. doi:10.1029/2000TC001243. ↑ Clift, Peter D.; Shimizu, N.; Layne, G.D.; Blusztajn, J.S. ; Gaedicke, C.; Schlüter, H.-U. ; Clark, M.K. ; Amjad, S. (August 2001). 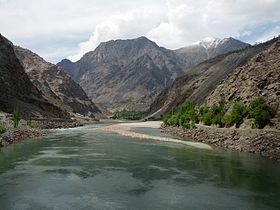 "Development of the Indus Fan and its significance for the erosional history of the Western Himalaya and Karakoram". GSA Bulletin খণ্ড 113 (8): 1039–1051. doi:10.1130/0016-7606(2001)113<1039:DOTIFA>2.0.CO;2. ↑ Clift, Peter D.; Blusztajn, Jerzy (15 December 2005). "Reorganization of the western Himalayan river system after five million years ago". Nature খণ্ড 438 (7070): 1001–1003. doi:10.1038/nature04379. PMID 16355221.